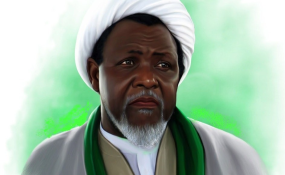 Nigeria's Information minister, Lai Mohammed, has claimed that the government spends about N3.5 million monthly to feed a Shiite cleric who has been detained by government for over two years. The massacre has been condemned by local and international rights groups and is currently being investigated by the International Criminal Court (ICC). Although no soldier is being tried or has been prosecuted for the killings, Mr El-Zakzaky has been detained by the government since the December 2015 incident. The government also ignored a court ruling that ordered that he be released and paid compensation alongside his detained wife, Zinat. Mr El-Zakzaky was initially held for about two years alongside his wife, Zinat, without trial. After much public outcry, he was charged before a Kaduna court for alleged conspiracy and abating culpable homicide. Mr Mohammed's statement on the Shiite leader is believed to have been made on Wednesday, same day the Kaduna court denied Mr El-Zakzaky bail. A video of Mr Mohammed making the claim while addressing some journalists has gone viral. PREMIUM TIMES confirmed Mr Mohammed did make the claim but had told journalists he was speaking off the record. The video, however, still made its way to the public and has since gone viral, drawing wide criticisms of the minister. "It costs the government about N3.5 million every month to feed him," Mr Mohammed said. The information minister was at that point interjected by the transport minister, Rotimi Amaechi, who jokingly mocked the figures saying "then you people need to take me in o." Mr Mohammed, then defended the figure he announced, saying "Honestly, don't quote me, but these are the facts." At this point Mr Amaechi joked further that he "can take N500,000" monthly to be held in prison by the government. Mr Mohammed then briefly explained that he "asked" from relevant people to arrive at his information. "So please. We don't want to inflame passion. The issue is a very sensitive matter. But that is the situation. The Islamic Movement of Nigeria are a different kettle of fish," he said. At N3.5 million monthly, it would mean the government claims it spends about N115,000 daily to feed the forced prisoner. Mr Mohammed's claims of N3.5 million monthly also comes at a time the government is finding it difficult to pay a monthly minimum wage of N30,000 to workers. Already, many people on social media who have seen the video have attacked the minister for lying and brandishing false figures.